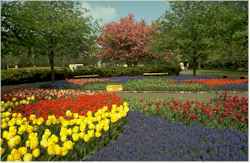 The local government's tourism site is skimpy, but it does contain some information on what to see and do in Keukenhof's home town. If you're looking for a place to stay in Lisse, try the three-star Lounge Hotel de Duif (which is within walking distance of Keukenhof and the Black Tulip Museum) or the four-star Hotel Nachtengaal van Lisse (which is 1.3 km or less than a mile from the gardens, with bike rentals available). Holland's once-in-a-decade World's Fair of horticulture will run from April to October 7, 2022. It's only about an hour to Keukenhof from Amsterdam, the subject of this illustrated 24-page collection of annotated Web links.